Ugadi pachadi recipe – Ugadi recipes 2019. Happy Ugadi to all the readers and friends celebrating. Wishing a happy and prosperous year ahead. 🙂 . This year Ugadi is celebrated on 6th April 2019. It is a day celebrated to mark the beginning of New Year in Andhra and Karnataka. It is also celebrated in few other states. 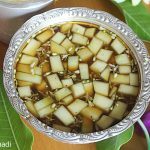 In this post, I have shared the recipe of ugadi pachadi along with a list of ugadi recipes you can try. Ugadi pachadi is one of the most important ugadi recipes that is prepared on the day of ugadi and is offered to Gods seeking blessings for the year ahead. This is the first food we consume on the day of ugadi after offering it to god. Ugadi pachadi is a mixture that has six different tastes sweet, sour,salt, pungent, spice and bitter. It signifies that life is a mixture of happiness, sadness, anger, disgust, fear and surprise. Sweet taste comes from jaggery & it symbolizes happiness. Astringent or pungent taste that comes from raw mangoes & it symbolizes surprises in life. Bitter taste that comes from neem flowers represent the sadness. Sour taste comes from the tamarind & symbolizes unpleasantness. Salty taste is from salt & represents fear of the unknown phase. Hot or Spice comes from pepper & symbolizes anger. 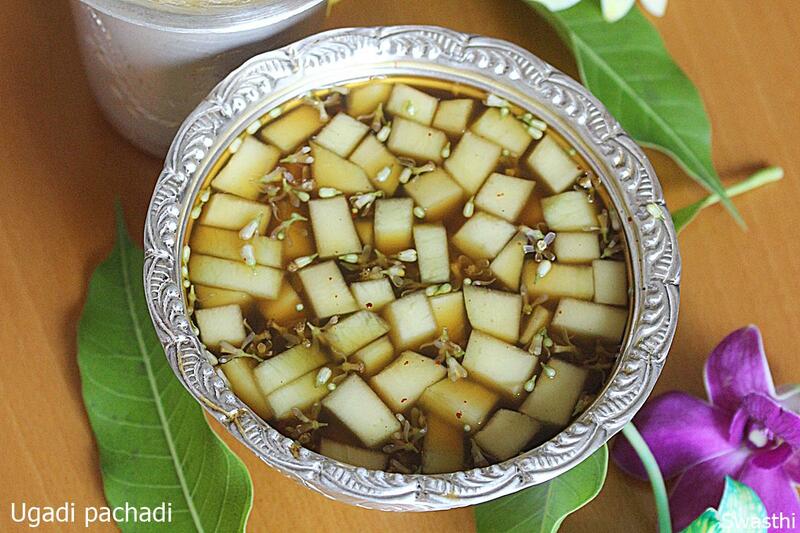 Ugadi pachadi is made of neem flowers, raw mango, jaggery, pepper powder, coconut and salt. There are slight variations of making this. Some of the other ingredients that are used for making this tastier are fried gram (putnalu pappu), cashews, raisins and sliced banana. All the ingredients are approximations only including water in the ugadi pachadi recipe and can be adjusted to suit your taste. Update: For years I had made ugadi pachadi using red chili powder instead of pepper powder. But recently I did watch a old video that was sent to me by a family member which talks about the traditional Naivedyam foods or foods offered to gods. According to that source for ugadi pachadi, only pepper powder has to be used and not chilli powder. So I have updated the recipe. This may also vary according to family’s beliefs and customs. For ugadi, I usually prepare Garelu or minapapappu punugulu, pulihora, annam payasam, chalimidi, vadapappu and panakam. All these are made for pooja offerings. For the evening snack time, I mostly make masala vada or make perugu garelu with the garelu I make in the morning. One day ahead I make either 7 cups burfi or mysore pak and some ladoo variety. I have compiled some recipes for ugadi. Please scroll down to find them. Ugadi recipes – Ugadi pachadi is a mixture of various ingredients that has 6 different tastes. It signifies that life is a mixture of happiness, sadness, anger, disgust, fear and surprise. Wash tamarind and soak it in ½ cup warm water till it softens. Traditionally only fresh neem flowers are used to make ugadi pachadi. But if you live in a place where you don’t get fresh flowers then use the dried ones. While the tamarind soaks, pluck the flowers from neem sprigs. Or alternate quick method: add the neem sprigs to a thin cloth, bring the edges of the cloth together so that they don’t fall off from the cloth. Hold the edges tightly and hit the cloth on to the kitchen counter several times. Neem flower or petals get separated from the sprigs and fall of in the cloth, collect them and set aside. Add grated jaggery to another one cup water, stir till it melts off. Filter it through a coffee strainer to another bowl, filter the tamarind pulp or water as well to the same bowl. Next add rest of the ingredients. Mix well. Do not taste it if you intend to offer it to god. Offer ugadi pachadi as naivedyam. Share ugadi pachadi with your family members & friends. Rice payasam is a delicious & traditional dish made with rice, milk, ghee, nuts & cardamom powder. This is a traditional Andhra style dish which we prepare during most festivals to offer as naivedyam. Traditionally the payasam is prepared with cow’s milk & ghee. Jaggery is used to sweeten the rice payasam. However if you prefer using sugar you can check this post on rice kheer. Semiya payasam is another quick dessert prepared with vermicelli, milk, ghee, sugar or jaggery. Sweet pongal is a dish made with rice, moong dal, jaggery, cardamoms, nuts & ghee. Making sweet Pongal is much easier than the rice payasam as there is no continuous stirring of the dish since there is no milk used here. So the cook time is also less. Rava kesari is a dessert made with rava or semolina, ghee, nuts & sugar. This is a super quick recipe which can be made just under 25 mins. Rava kesari can also be made in many flavors like milk kesari, fruit kesari, pineapple kesari & mango kesari. Paala thalikalu or thalikala payasam is a traditional dish made with handmade rice flour vermicelli, milk, jaggery, nuts & ghee. In this post I went ahead showing how to make the thalikalu with a murukku press. So it is simple enough even for a beginner. Some people consider semiya as a processed food so avoid offering to the gods for naivedyam. They prefer these thalikalu as they are freshly made. Poornam boorelu are sweet stuffed batter fried balls. The stuffing is made with chana dal and jaggery. I went the cut short way to make the outer coating with urad dal & rice instead of rice flour. Medu vada or Garelu are a traditional deep fried snack made with black gram or urad dal. This post will help you to make the best fluffy & crisp vada at home using the mixer grinder. Just avoid using onions, chilies & ginger if offering to gods. Urad dal bonda or minapa punugulu are quick alternate to vada or garelu. These are almost similar to the vada in taste only differ in the shape. These are super quick to make & are easy for those who have difficulty shaping the vada batter. Panakam is a traditional drink made with jaggery, cardamom powder & water. I make panakam & chalimidi during ugadi, sri rama navami , vinayaka chavithi, Devi puja – dassara & Diwali. In some regions of Andhra Pradesh it is a tradition to offer this cooling drink to the deities. Chalimidi & vada pappu are a combination of rice flour sweet with soaked moong lentils. We offer chalimidi & vada pappu always in combination with panakam as a tradition. Pulihora is a traditional Andhra style tamarind rice. This is prepared in most traditional households during festivals & is also offered to the gods. I have shared the recipe of we make at home. Puliyogare is a Karnataka style tamarind rice which is made with fresh ground spice powder. It is completely different from the Andhra style. This is recipe will give you a very flavorful puliyogare. Mango rice is another quick recipe you can make for ugadi lunch. Mangoes will be in full season during ugadi and most of us will have it. This is easy and quick to prepare. You can also make the mango mix and store it in a bottle for further use. Curd rice is a simple dish made by mixing cooked rice with curd. Then it is tempered with spices & curry leaves. Coconut rice is a tempered rice made with fresh coconut, peanuts, curry leaves, ginger & chilies. You can also make this coconut milk rice. Bisi bele bath is a flavorful dish made with rice, lentils, spice powder & mixed veggies. 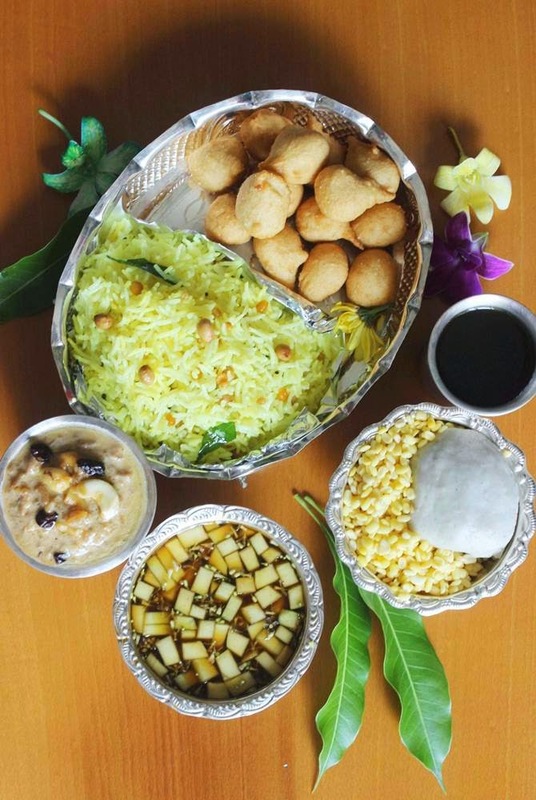 This is a traditional dish which is prepared even on festive days. Sambar rice is another similar recipe made with rice, dal, sambar powder & vegetables. 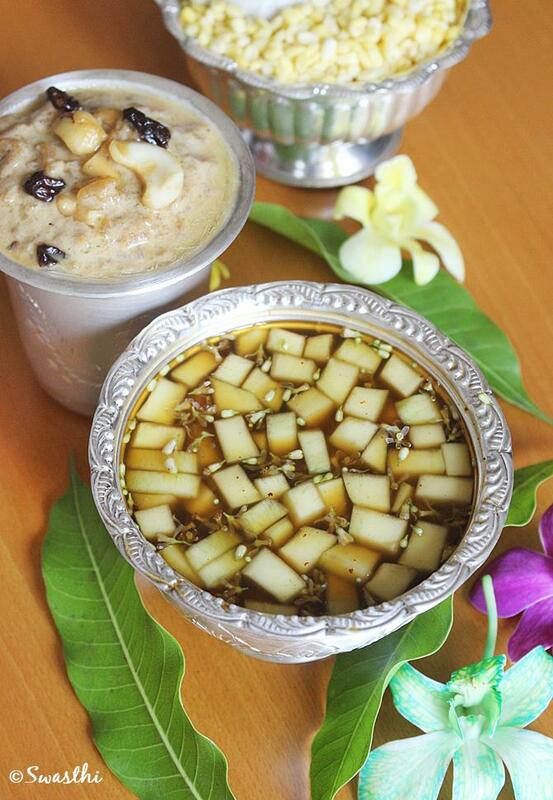 Here are some sweet recipes you can make for Ugadi. These can be made 1 to 2 days ahead of the festival. Coconut ladoo is another popular sweet that is made in most south Indian homes. I have shared a traditional recipe using fresh coconut, sugar or jaggery, cardamom powder. If you make these ahead refrigerate them & use up within a week. Boondi ladoo are sweet balls made with gram flour, sugar, ghee & elaichi. I have shared the recipe of tirupati ladoo in this post. Kova ladoo also known as kova kajjikayalu are a popular traditional dessert made with mawa or khoya, coconut, jaggery & sugar. These are mawa balls with coconut stuffing. Mysore pak is a royal dessert from mysore. It is a burfi variety made with gram flour, ghee & sugar. This detailed post will help you to make the best mysore pak at home. Rava burfi is another burfi variety made with rava, sugar, gram flour & ghee. 7 cups burfi is a popular south Indian sweet made with 7 cups of ingredients. It is made with gram flour, coconut, nuts, ghee & sugar. Coconut burfi can be made in 2 ways. I have shared both the recipes on this post. Here are some popular snacks from Andhra & Karnataka cuisines. You can make snacks like murukkulu, nippattu & chekkalu 1 to 2 days ahead of the festival. Punugulu is a deep fried snack usually made with left over idli dosa batter. However during festivals these can also be made with fresh batter or use the leftover garelu batter. If using garelu batter then add little rice flour. Masala vada is are vada variety made with chana dal, spices, herbs & onions. These crisp fried vada can also be served as a side in a meal wiith coconut chutney. You can also check these mixed dal vada. Mysore bonda are instant bondas made with maida or all-purpose flour. However I have made these with wheat flour, onions, chillies, coriander leaves & curd. These go very well with any chutney. For variations you can also check this aloo bonda & veg bonda. Murukku or murukkulu are most commonly made in many telugu speaking households for every festival, especially if there are kids at home. Somehow my kids do not eat a lot of these so I make them only sometimes. You can also check these butter murukku & ribbon pakoda. Nippattu, thattai & chekkalu are 3 different versions of the same crisp fried rice crackers. Each of these have a different texture & flavor. Wow 😮 !!! What a lovely spread of dishes. Looks so mouthwatering and yummy 😋. I have been following your blog for 2 years now. Every one at home loves my food. Thank you very much. Wishing you a happy ugadi. Wish you all too a very Happy Ugadi. Thank you so much for following the blog.